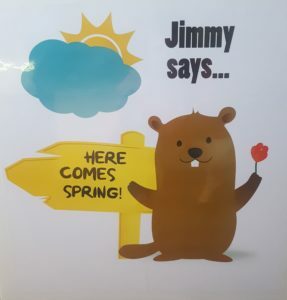 Sun Prairie, WI Groundhog Jimmy February 02, 2019 Here Comes Spring! 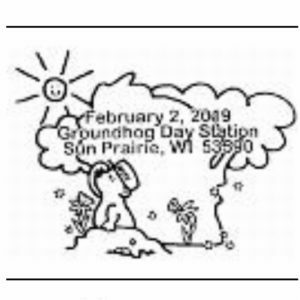 The Sun Prarie WI Groundhog Day 2019 Pictorial Postmark is available for the next 30 days by mail. 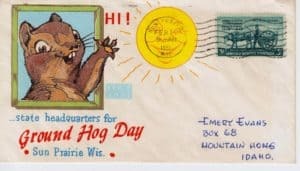 Before showing the details on the Groundhog Day 2019 Pictorial Postmark, I’m sharing about the City of Sun Prarie, WI and their Jimmy the Groundhog, including a vintage City of Sun Prarie Groundhog Day commemorative postcard. To begin with, in reading the History of Groundhog Day section on the website it is sharing the following. 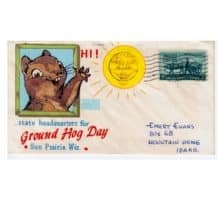 You will want to read the article especially as it includes the contributions of the Postmaster; and the “good natured ribbing” with Punxsutawney, Pennsylvania. 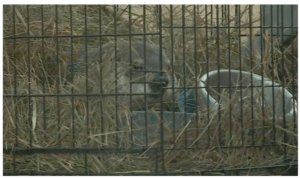 Secondly, here is a photo of Jimmy the Groundhog. Furthermore, if you are new to requesting a pictorial postmark or just wanting a refresher on the details, this will walk you through the steps for requesting. As we wrap up I’m including the links from the previous three years on this day. P.S. Day 2 of InCoWriMo 2019!